Sorry, the audio for this interview is no longer available. We’re working on reposting it when we can get a copy. 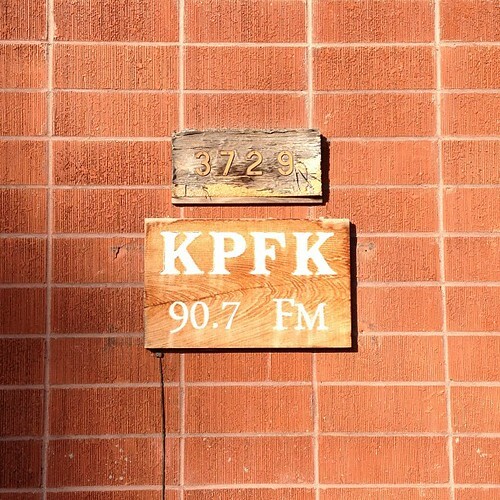 On Tuesday morning I had the honor of co-hosting Bike Talk, a locally produced podcast through 90.7 KPFK. The shows producer, Nick Richert, assembled an international panel of professional bike planners and advocates to talk about their work. Kyle Wagenschutz, Bikeway/Pedestrian Coordinator, City of Memphis, Tennessee. I asked a few questions based on my own personal experiences as a bike lane advocate for bike lanes on North Figueroa Street (I use the hashtag #fig4all to keep track of the issue). Anti-bike paranoia and the U.N.
We covered our panelists reaction to opposition to bike lanes, including Tea Party-based fears that bike lanes are part of a U.N. conspiracy surrounding something called “Agenda 21“. No U.N. stooges outed themselves, but we’re still looking! Kevin Mayne of the ECF was well familiar with Agenda 21 but dismissed ideas that the U.N. was part of a sinister conspiracy. Zach Vanderkooy of the Green Lanes Project paraphrased Tip O’neil with, “All transportation is local.” The conspiracy theories were seen as a proxy for problems people had with the potential disruption bike projects represent to their views of what is normal. We also asked, “Does it take billionaires, like NYC’s Mayor Bloomberg or Mark Gorton of Streetsblog, to get bike lanes? Are bike lanes a smart money investment for cities?” Pro-bike billionaires were cited as being helpful, but not necessary, in efforts to increase bike projects. Bike projects were generally seen as a smart money investment by Roger Geller of Portland by attracting talented pools of workers in bike friendly quarters of the city and by keeping money that would otherwise leave the community in car expenses instead get recirculated through more in-state and in-city consumption. Kyle Wagenshutz of Memphis, working with a tin budget & a short time frame in his city’s shift bike-friendliness, has used bikes to close gaps that they cannot close in their transportation network with big-dollar car and transit projects. Wagenshutz also cited the interesting side note that the CEO of AutoZone, based in Memphis, has donated quite a bit to improving bike access in his hometown – reflecting the mood of local business interests who are generally supportive of pro-bike efforts. Ethan Spotts of the Active Transportation Alliance in Chicago has seen the positive impact that a few powerful businessmen have had in bike project implementation. More importantly, Spotts cites Mayor Emmanuels inclusion of the Alliance at the conference room table when formulating his transportation policies as more central to the direction of work in Chicago. The Chicago mayor’s focus is based primarily in promoting business by attracting high salaried tech employees to companies like GrubHub, Google, and others. Access to bikes or access to bike lanes? At the Flying Pigeon shop we’ve had a tough time making money selling cargo bikes, and so I asked about any schemes to help families and small businesses micro-finance utility bike purchases. Our panelists boiled this question down to a question about access to bikes, concluding that access to bikes is not the hurdle I imagine it to be. Instead, according to Kevin Mayne of the ECF, the hurdles are many and varied but efforts should be focused on increasing numbers of cyclists overall as there exist a large number of bikes in garages and storage centers. Kyle Wagenshutz, former director of Revolutions Memphis, and saw that helping get people bikes didn’t have an impact on cycling levels until the city built bike lanes – subsequently seeing a 400% rise in cycling rates since the installation of lanes. Bike project buddies – who are you collaborating with? Next, when it comes to bike advocacy cyclists can often find a friend in outside groups in health care, local business interests, and the like. We took some time to hear from our panel about the types of financial and political alliances they have found to be fruitful. Ethan Spotts made it clear that in Chicago most of the money for bike projects has been flowing from federal and state grants and transfer payments. Spotts cited $22 million in federal grants that are funding Chicago’s new bike share. Spotts says that local chambers of commerce are spending on bike parking and digital transit arrival signs in local shops. Some aldermen are using their discretionary $1.3 million budgets to spend on bicycle and pedestrian projects. Gerrik Kransky, of the BTA in Oregon, stated that when working on projects, like bringing bike share to Portland community support, political support, funding and design are four elements they focus on – with community support being fundamental to their efforts. Kaiser Permanente has come to work with the City of Portland to sponsor a seriescar-free street events called Sunday Parkways as well as a sponsor of the bike share. Is the anti-bike opposition just cranky? We then asked our panelists if they face any sort of organized opposition or if it was just a case of cultural inertia they seemed to be battling most of the time. The consensus of the panel made it clear that we are mostly dealing with cultural inertia and the very personal, local, nature of transportation projects like bike lanes. Is it harder to get bike lanes installed in Europe vs. the U.S.? According to Kevin Mayne, that really depends on the country in Europe as some of the bike mode shares are similar to the U.S. Mayne says that the “tipping point” for acceptability of bike projects is around 5 to 6% of mode share, after which ridership takes off once politicians see an opportunity to win voters to their sides. Zach Vanderkooy of the Green Lane Project concurred with Mayne that loads of Europe’s streets and cities are horrible places to ride a bike. Vanderkooy thinks that the U.S.’s leading cities are out in front of many European cities on several fronts. When asking people why they are or are not riding, Vanderkooy cites, is that people do not feel safe and a stripe of white paint is not going to change their mind. The Green Lane Project is an effort to show examples of best practices in this regard. Ethan Spotts of the Active Transportation Alliance in Chicago makes the case that the Green Lane Project has been fundamental to approaching changes in street design using best practices and rhetoric from around the world. Our survey at the end of the show, “Coaster brake or freewheel?”, was a disaster for the honorable coaster brake. The show was wrapped up with a talk about some of the takeaways from the panelists answers as well as a discussion of the way newly elected Mayor Eric Garcetti might best move forward in implementing Antonio Villaraigosa’s (so far) successful Bike Plan.